Here we go, folks. With a flourish and a bow, a drumroll and a trumpet blast, I give you the cover for the third book of the Crater Lake Series – Chasing Down the Night. As a nine-year-old’s dreams reflect a dangerous reality, many encounter issues of the past. This is a novel for those who work at building family ties by strengthening the traditional and creating the new. Chasing Down the Night explores a wide-ranging emotional landscape while highlighting the many aspects of day-to-day, rural life. Tears and laughter are inevitable. Cougar photo courtesy of Father Charles Brandt. Background photo and cover design by Bruce Witzel. Publication date is set for mid-May. I can’t wait. What about you? 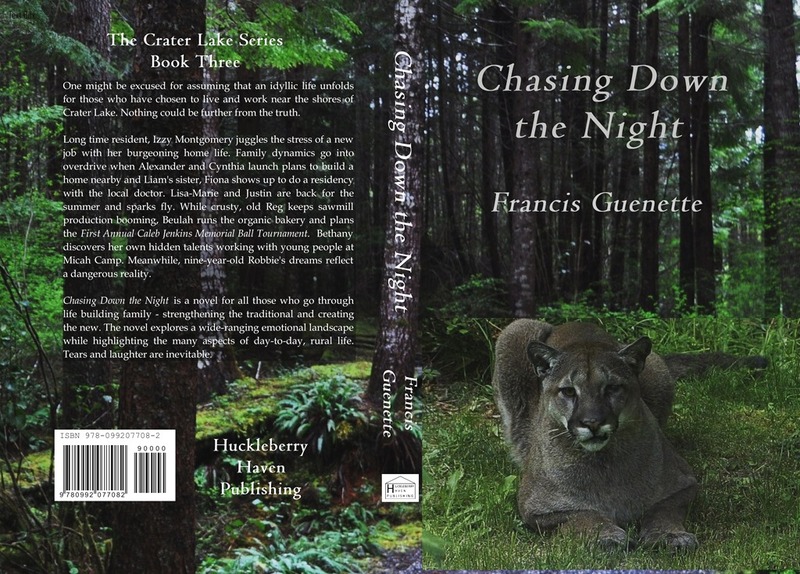 This entry was posted in Book Promotion and Marketing, Photography, Reading, Self-Publishing, Writing and tagged book blurb, book covers, Chasing Down the Night, cougars, Crater Lake Series - Book 3, Huckleberry Haven Publishing, Northern Vancouver Island. Thank you so much. I’m more than a bit in love myself. Love the cover! And looking forward to reading the book! Many thanks for being along on this wonderful adventure with me. The cover looks great, Fran! Excellent cover! I hope Fr. Brandt had a long-range zoom lens. That’s a big cougar. Thanks. As I understand the story, the cat simply strolled right up his path and made itself comfy on the grass in front of his porch. I’ve read that cougars are as curious as regular house cats. I’d say I’m looking forward to it! Thanks, Patricia. Champing at the bit to get it out there. My wife Francis’ work as an educator, researcher and trauma counselor has lead her to creating the third novel of the Crater Lake Series , due to be released in mid May. 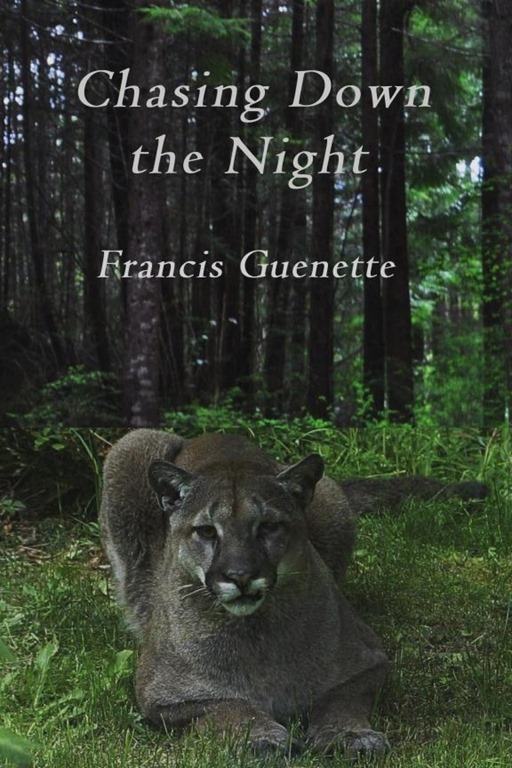 Not to give away the storyline, a cougar plays a key role. The cover of Chasing Down the Night is a composite of two images. Believe it or not, the background image is of the forest that surrounds our driveway. The more amazing and prominent image of the cougar was taken by Charles Brandt just outside the porch of his hermitage. Father Charles is a Catholic hermit priest, a deep ecologist and a world renowned book and art conservator. Please head over to Fran’s blog, disappearing in Plain Sight, to give her a boost and a thumbs up. Many thanks for the reblog and all of Bruce’s followers who have popped over. It is indeed a trio of content, there’s no pressure & I could never live without that outlet. Fabulous cover! I love it! Thanks! We have more than a few tweaks and wrinkles to work out still but almost there. Depending on who you identify with – I think this newest novel gives something for everyone. Can’t wait to get it out there in the public realm. It’s a beauty, Fran. I love the one-sentence summaries on what’s in store for members of the Crater Lake gang. Thanks, Gwen. Writing the book synopsis is my least favourite thing to do. Still a few wrinkles to iron out of the cover but I’m almost there. I’m another one who found my way to your blog through Bruce. I am so glad he pointed in your direction! 🙂 Congratulations on another book. I’m always interesting in good reading!